Until the Splash House pool and music festival, I had never really been a fan of music festivals held in the United States, the overwhelming police presence, the over-commercialization of American music festivals and the hefty price tags of stateside festivals left me with a preference for music festivals overseas. So, when I got a message alert from Partytrail’s apple mail client about an opportunity to be part of the media delegates for an event called the Splash HousePool and Music festival in Palm Springs, California, I couldn’t help but wonder if this was going to be another festival that was just really an opportunity for Coca Cola to sell their wares. The Saguaro Hotel Resort Was One of Three Locations Where Splash House Was Held. Fortunately, I couldn’t have been more mistaken. 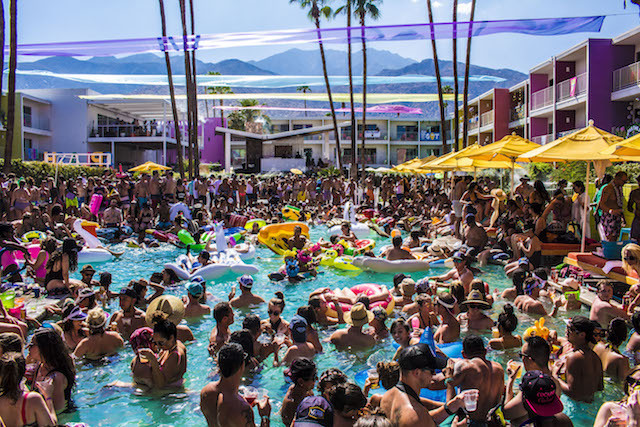 The Splash House pool and music festival co-founded by Tyler and Kelly McClean was something special and every music festival in America could take a page from this festivals playbook. 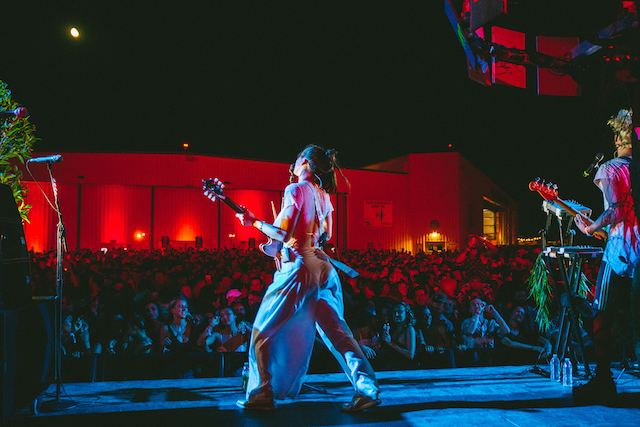 They kept it simple and focused on great music, ruthlessly efficient logistics and keeping their attendees engaged throughout the duration of the event. While the event was very secure and properly organized I didn’t get the feeling that I was attending an event at Fort Knox. There was an organic feel to the event and everyone I encountered seemed to be there to meet people, listen to good music and indulge in some positive vibes. Unlike other events I had attended previously, I hardly noticed the presence of advertisers or sponsors, a pet peeve of mine. Instead, I was able to focus on actually enjoying music, fraternizing with like minded people and soaking up some desert sun. After my amazing week at the Yacht Week in Croatia (my wrist bands are yet to come off by the way), it was nice to re-live some of the more memorable moments of the Yacht Week only this time in California at Splash House. 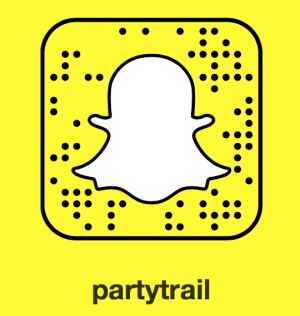 Once it was confirmed that the Partytrail was to be part of Splash House’s media delegates, I headed to Palm Springs from Los Angeles were I am based, and joined the crowd of attendees, predominantly California college students and locals in their early to late twenties. 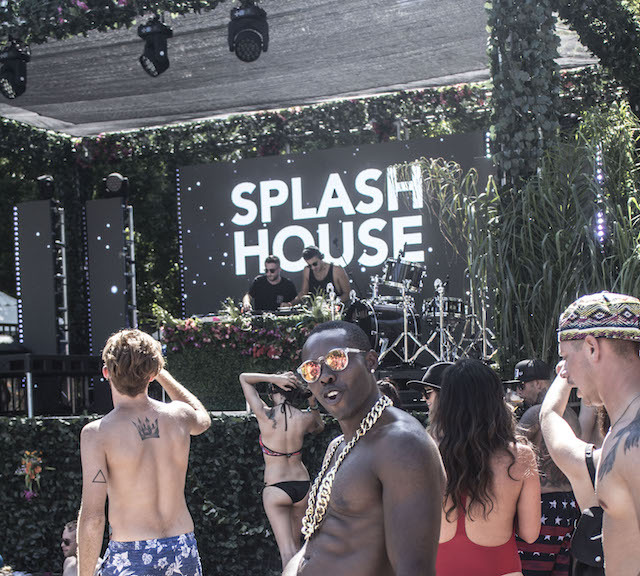 The Splash House Music and Pool Festival was a 21+ event with most attendees being College students from California. Splash House is held poolside at three separate resort style hotels out in the desert in Palm Springs. 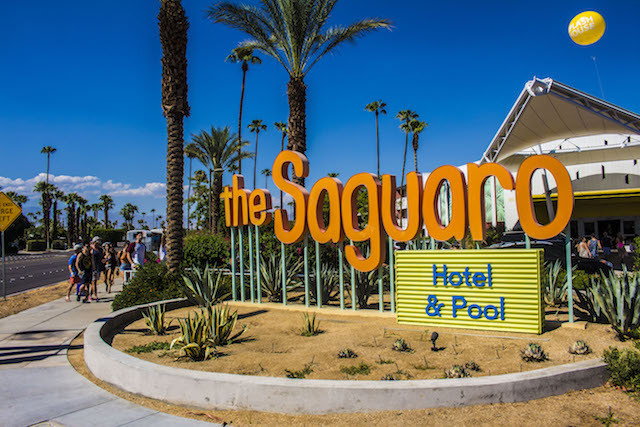 The hotels that hosted Splash House this year were The Saguaro, the Renaissance and the Riviera. Guests typically book hotel rooms as part of the festival package and take shuttle buses in between all three hotels to see different DJs and musical acts. The shuttle buses were organized such that you were barely 15 minutes away from each hotel at any point so you were pretty much within reach of any of the stages at each of the three hotels. 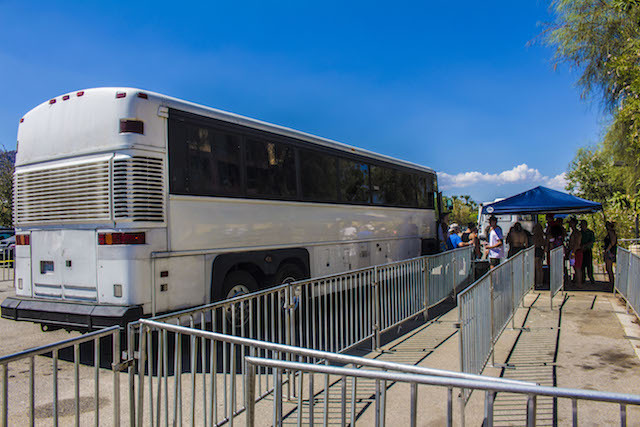 To make the shuttle rides even better, each bus was equipped with booming speakers that played music at full volume, with riders actively chanting at the top of their lungs, this ensured the party didn’t stop while you were in between venues. There was also an “after hours party” at the festival held at the Palm Springs Air Museum between 10 pm and 2 am on Friday and Saturday. 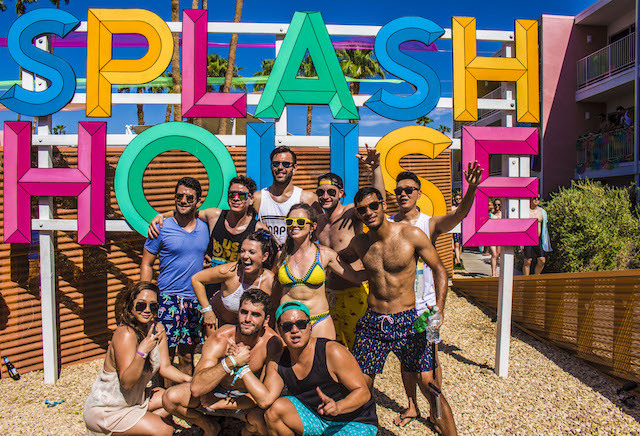 Acts that performed at the Splash House after hours party included Klatch, Elderbrook, Sofi Tukker and Bob Moses. Saturday had James Murphy playing his DJ set from 9 PM till 2 AM. 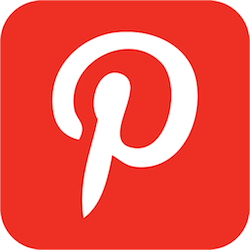 Tip: To have a smooth sailing experience at Splash House, it is best to download their mobile app on android or iOS as this will give you all the information you need about everything from performance times to Shuttle pick up times. 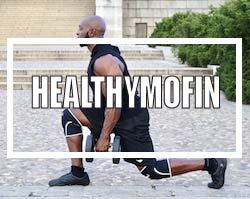 Saturday, in my opinion is when things really went into full gear at the Splash House, the morning started out with guests attending one of two Yoga sessions held at the Renaissance by Pi Yoga pants or the other session led by Tiffany Baker at the Saguaro. 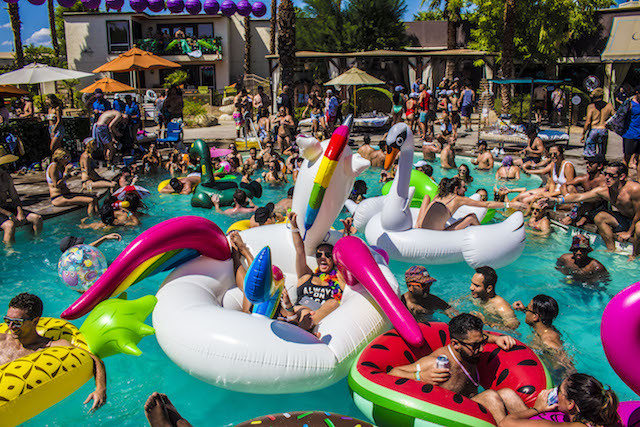 Attendees then got breakfast, got their floaties pumped and started heading to the pools of their respective hotels where stages had been set up for the musical acts and DJs to entertain an undeniably enthusiastic crowd. The Vibe at the pools was nothing but utter mayhem, as guests went all out to bring the party to seriously high octane elevated levels. 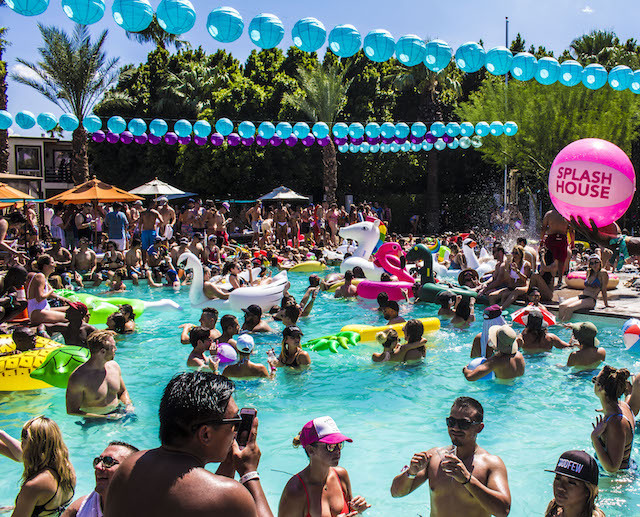 The pools were packed edge to edge with attendees splashing water, pumping bubbles from bubble guns and pumping their fists to DJs on stage jamming their tunes just a couple of feet away from them. The greater California area is notorious for people being “too cool for school” and preferring to sit on the sidelines when attending pool parties. I promise you, this was not the case at Splash House. Another Scene Pool Side The Rivera Hotel, One Of The Three Hotels Where Splash House Was Held. Attendees got into the water, splashed around, rode on floats, made friends, sang along and soaked every second of this wonderful event. 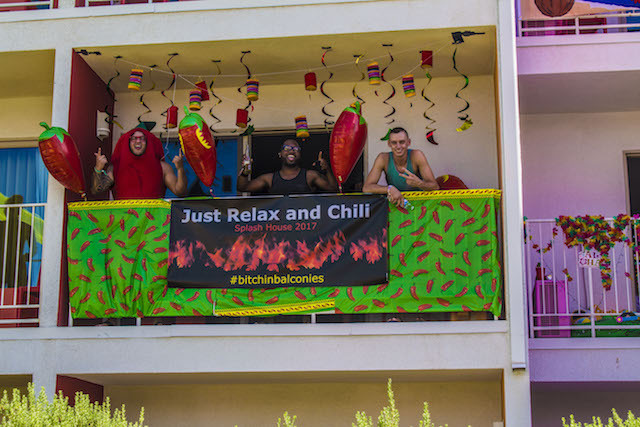 As an added incentive to get people to be full participants of the event, guests were encouraged to decorate the balconies of their hotel rooms according to a theme of their choosing. Guests who participated got a chance to win a full travel package to the upcoming year’s festivities. To participate guests had to upload pictures of their fully decorated balconies onto Instagram with the hashtag “#bitchinbalconies” and if they impressed well enough they got to take home prizes. Tip: If you intend to take part in the #bitchinbalconies contest at Splash House, it might be a good idea to get your hotel room at the Saguaro hotel as their balconies seem more suited to being decorated.I got a hotel room at the Riviera and it as quite challenging to get our decorations in place. There were several smaller off-shoot parties at Splash House. Here are attendees of the No Pants Party. One of the things I also really liked about Splash House was the warmth and openness of the attendees. There were several side parties being held by attendees in their hotel rooms and one such event that I attended was the “No Pants Party” held at one of the rooms at the Riviera Hotel. The final night at Splash House saw attendees wrap up at the pools of all three hotels and then head off to Zeldas night club in Palm Springs for one final rager before closing out Splash House festival season. Mind you, Splash House is held twice a year (once in June and once again in August) and Zeldas was definitely a great way to close things out. Attendees got a chance to extend a weekend they unanimously didn’t want to end deep into the early hours of Monday morning. At Zeldas, I met up with a crew of new friends I had just made, had some drinks and talked about one of best California weekends we had been opportuned to partake in for the longest time. Splash House was amazing to say the least and I will definitely be back, enthusiasm in tow for another weekend for the ages, fate willing in 2018.